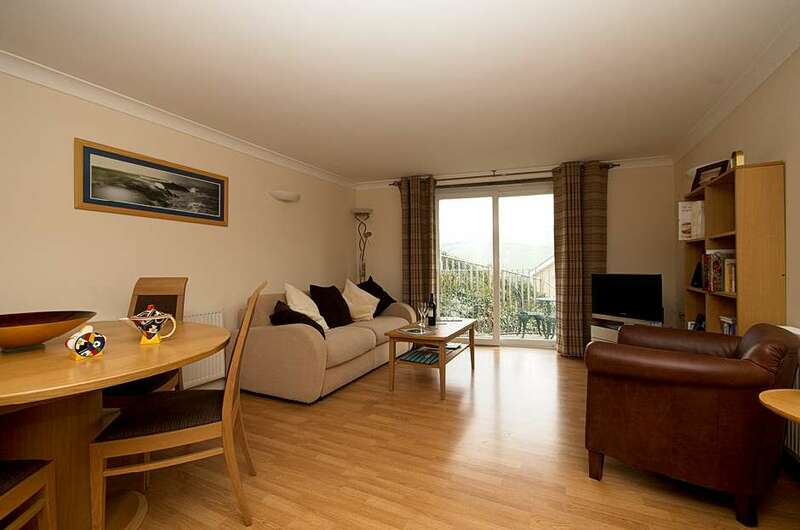 With such a wonderful view of Woolacombe beach from the balcony, this little 2nd floor apartment is such a lovely place to stay as it is also so near to Woolacombe village, beach and all the amenities the resort has to offer. Whether you are here to walk, surf, chill or build sandcastles, this location is perfect. As with many of our apartments, the living, dining and kitchen are open plan making it a cosy and extremely sociable place to be. The comfortable quality sofa and 2 leather armchairs are positioned to enjoy the view in the daytime and the TV, DVD and CD music system at night. The wooden round dining table seats 4 and the wood fronted kitchen units house full size fridge freezer, dish washer, washing machine, cooker and hob. There is a microwave and the kitchen is extremely well equipped as it has been a second home to the owners for 5 years. I am really pleased to offer this charming apartment which will cater well for a young family or couple at any time of the year. Cot and highchair. Board store and use of communal garden with BBQ and sea views. 1 parking space. Saturday changeover.